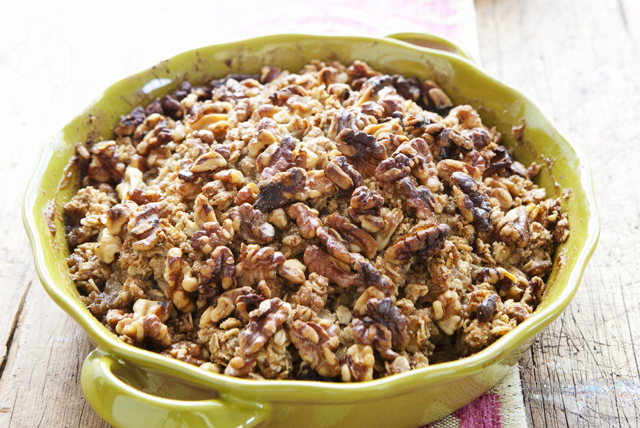 A delicious way to use seasonal fresh fruit, this delicious fruit crisp recipe is made with four different fruits, then topped off with a crisp streusel topping. Mix dry jelly powder and water until blended. Combine fruit in large bowl. Add jelly mixture; mix lightly. Spoon into 2-L casserole dish sprayed with cooking spray. Combine oats, flour and sugar in medium bowl. Cut in margarine with pastry blender or 2 knives until mixture resembles coarse crumbs. Stir in nuts. Sprinkle over fruit mixture. Bake 40 to 45 min. or until streusel topping is golden brown, and fruit mixture is hot and bubbly. The term bumbleberry refers to a mixed-fruit crisp or pie - generally containing apples, rhubarb, and/or berries, such as blueberries, blackberries, raspberries and/or strawberries.